Passionate about politics? Dedicated to saving the environment? Outspoken about animal rights? No matter the cause, kids can make a difference! This guide features change-maker tips as well as anecdotes of young activists around the globe and throughout history. The suggested activist tactics covered range from tweaking everyday habits--like the sisters who call themselves the Plastic Patrol and convinced their family to stop using grocery bags and straws--to stretching to achieve something extraordinary--like the teen who used food waste to invent a water purification system. 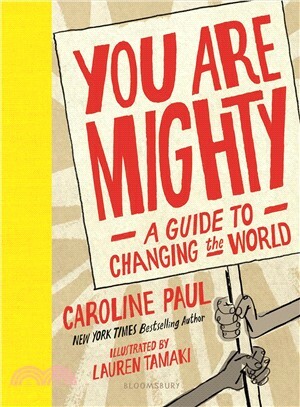 Told in Caroline Paul's trademark breezy voice and including Lauren Tamaki's delightful spot illustrations and tons of DIY activities, this is the ultimate practical--and fun!--manual for kids looking to change the world. Lauren Tamaki has illustrated articles for the New York Times, Lena Dunham's Lenny Letters, and the Brooklyn edition of the Wildsam Field Guides. You Are Mighty is her first children's book. She lives in Brooklyn, New York.